Some police agencies are finding that bigger is better. 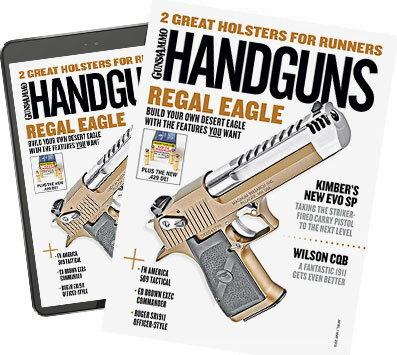 Last year, the Rainbow City Police Department in Alabama began the search for a new duty sidearm after its .40 caliber handguns experienced some reliability issues. "We took advantage of that situation to look at different calibers," says Sgt. Chase Jenkins, the department's firearms training officer. "An underlying problem we had here was some officers just couldn't handle the .40 caliber recoil, which is significant. Our qualification scores often reflected the inability to handle that recoil." Those low scores also meant additional training sessions on the range and extra ammunition expended, all of which cost the department funds it needed elsewhere. So the decision was made to examine various handguns with less felt recoil. Meaning smaller calibers, right? Actually, the Rainbow PD focused on the .45 ACP and .45 GAP (Glock Automatic Pistol, for those unfamiliar with this round). "What we saw as a training staff was that every single officer shot better groups with the .45s, and they were the overwhelming choice of each officer," says Jenkins. "Everyone remarked about the less perceived recoil as compared to the .40 caliber round they were accustomed to firing." In the end, Rainbow City outfitted its 25 officers with the Glock 21SF in .45 ACP. Qualification scores jumped noticeably, with several officers scoring 100s for the first time in their careers. "The officers seem happy with their .45s," Jenkins adds, "and have more confidence in themselves." While the vast majority of officers carry 9mm and .40 caliber handguns, in recent years a number of enforcement agencies have made the switch to .45s. The list includes: Georgia State Patrol; Florida Highway Patrol; New York and Pennsylvania state police forces; Worcester, Massachusetts, and Hartford, Connecticut, police departments; Missouri's Buchanan County Sheriff's Department; and the Wisconsin Department of Criminal Investigations. According to Len Lucas, Beretta's manager of law enforcement and defense markets, .45s are increasingly popular at many smaller departments where officers have to purchase their own firearms. "The Chicago area, Wisconsin, outside of Minneapolis, upstate New York--those are big .45 areas," Lucas says. Lucas notes that law enforcement agencies across the nation began phasing out revolvers in favor of semiautomatics in the 1980s, with most opting for 9mms over .45s. The latter were mostly 1911 variations with magazines holding seven or eight rounds of .45 ACP. While the 9mms had less stopping power, they also boasted essentially twice the magazine capacity, so many departments went the 9mm route. When these 9mms needed replacing years later, the .40 caliber was the hot choice. "It seems like the wheel replaces itself," says Lucas. "It goes from .45 to 9mm, then to .40 caliber and back to .45. The circle keeps coming back." One reason the circle's returned to the .45 is increased magazine capacity compared to two decades ago. The Glock SF21s that Jenkins' department purchased come with standard magazines holding 13 rounds, as do the Springfield XDs. Another popular choice among law enforcement, the Beretta Px4 Storm .45, holds nine or 10 rounds, while the even more popular Glock 37 holds 10 rounds of .45 GAP ammunition. In July 2008, the Rochester New York Police Department replaced its aging 9mm Beretta Cougar with the Beretta Px4 Storm .45, purchasing 775 of the handguns. Robert Duffy is Rochester's current mayor, but at the time the decision was made to switch to a .45 caliber handgun, he was Rochester's chief of police. Duffy is also a former SWAT commander for the city. "The police needed a more powerful round," says Duffy, "one appropriate for an urban environment." The Rochester Metro Area logs in at just over 1 million people, so it has the crime and poverty found in larger urban areas. Still, police officer shootings here are pretty rare. A more common scenario where officers have to draw and use their sidearms? Serving warrants on drug dealers with big, vicious guard dogs. "We had cases where pit bulls were shot several times (with 9mm rounds), and they didn't even stop," says Duffy. "So we knew we needed something more." The .40 caliber was also considered, but in the end Duffy and his fellow officers decided they wanted the heft and stopping power of the .45 ACP. Pit bulls beware.